Advertising on Startup TechWire is available to select businesses and organizations reflecting the best of America's vibrant startup community. Startup TechWire draws thousands of visits each month from an audience eager to read interesting, fresh content about a myriad of issues related to business, innovation and education. 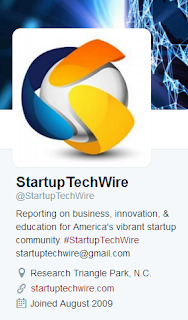 In addition to publishing on the StartupTechWire.com website, articles are republished and promoted via our LinkedIn page; our unique Startup Innovators LinkedIn group; our Twitter feed; and our Facebook page, increasing audience exposure and encouraging interaction with your brand. Startup TechWire currently offers two advertising options, sidebar ads and sponsorships. For more information, contact Dave Menzies, editor/publisher, at (910) 899-8935 or startuptechwire@gmail.com. For more information, email startuptechwire@gmail.com.